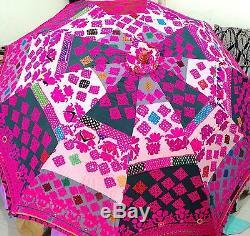 COLORFUL GARDEN INDIAN PARASOLS - UMBRELLAS BEAUTIFULLY HAND EMBROIDERED VINTAGE BANJARA FABRIC. Each umbrella is truly individual and is equally suited to warding off the midday sun or decorating a room or conservatory. The perfect garden accompaniment our new garden Indian parasols. Hand embroidered cotton, over a metal frame with matching inner cotton lining. 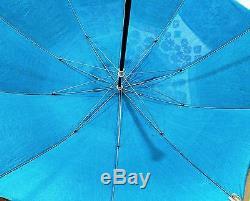 The parasol have a metal frame and angle adjustable pole. Stunning in every way and big. Ideal for garden restaurants , open / rooftop cafes. 6 ft in diameter and standing just under 8 ft tall. Height of pole : 225 cm (90"inches), the pole is in 2 parts 47" & 44. They join together with adjustable screw so that the angle of the umbrella can be adjusted. It is for decorative purpose and can be used to ward off the sun. As it is handmade product so it does not have the finish of a machine made umbrella. Please note that we recycle vintage tribal fabric from Indian tribes. Vintage tribal items in our shop use fabrics which may have some stains or imperfect embroidery. Or thread work To keep the originality of the fabric we dont alter these and are the characteristic of the fabric and cannot be considered as an imperfection. The details of the products or product specifications for instance weight, color, handwork details, size, etc. Quoted with the product displays are only approximate values. While every endeavor has been made to accurately reproduce colors, there may be variations in color of the actual product because of the nature of fabric dyes, weather at the time of dying and differences in display output due to lighting and digital photography and color settings and capabilities of monitors. Your satisfaction is our priority. If you received product and you don't find it as you expected , DON'T WEAR IT/ OR USE IT , we don't accept any used product. There may be some Import Duty or Vat on our product in few Countries. No return will be accepted if Import Duty or Vat is not paid. 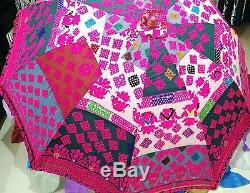 The item "Indian vintage banjara embroidery Garden Parasol Outddoor Patio Sun Umbrella" is in sale since Saturday, December 10, 2016. This item is in the category "Home & Garden\Yard, Garden & Outdoor Living\Garden Structures & Shade\Other Structures & Shade". 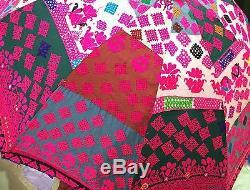 The seller is "royalejaypore" and is located in Jaipur, Rajasthan. This item can be shipped worldwide.